Welcome to Mossy Rock Farm! We are a small hobby farm nestled in a beautiful, remote corner of the West Kootenays in British Columbia. We are building a carefully selected herd of top quality registered Nigerian Dwarf Dairy Goats. We have sought out lines with high milk production, excellent conformation, and well supported, correct mammary systems. We plan to craft our breeding program to further improve on these traits, with a focus on ease of milkability and friendly, easygoing personalities. Our herd health is of utmost importance. We tested negative for CAE and Johnes in July of 2018 and will continue to test annually. Free of CL abscesses. We also have a varied collection of other lovely creatures around the farm to keep us on our toes! 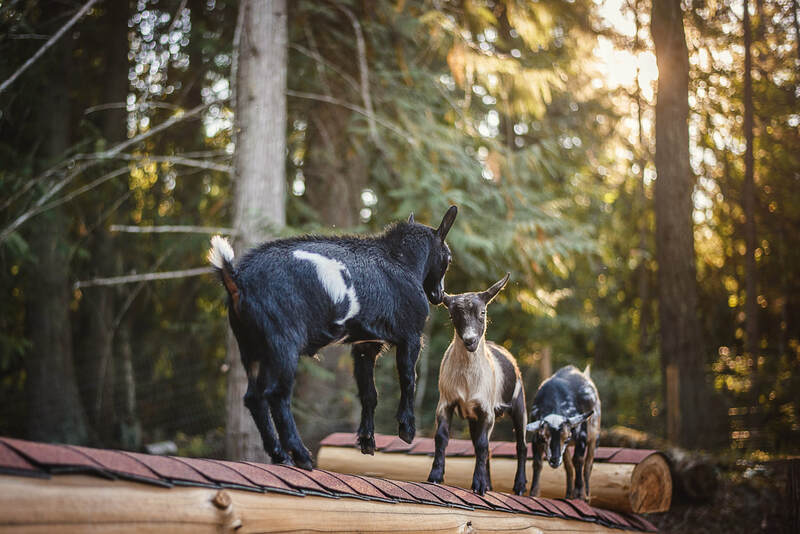 Nigerian Dwarf Goats are a breed of miniature dairy goats, originating from West Africa. They can produce a surprising amount of milk for their small size, and it has the highest butterfat content of any of the dairy breeds, making it the sweetest tasting milk and excellent for cheese making. Nigerian Dwarfs are friendly and interactive, making great pets as well as dairy animals. They come in a variety of coat colours and patterns and can have blue eyes.